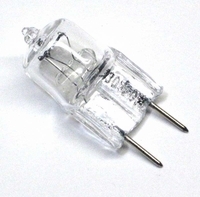 JCD type halogen 20W (watt) 120V (volt) double life short version bulb/lamp with G8 bi-pin base. Replacement for puck-lights, hanging lighting fixtures, goose-neck lighting fixtures, etc. This 130V bulb replaces lower voltage rated bulbs and lasts longer. A bulb rated at 130V is same as 120V double life bulb, using a higher voltage rated bulb is the only way to extend bulb life, replace less bulbs and save more money. Average bulb life 4000 hours, T4 bulb shape, clear quartz glass, tungsten filament, 180 lumens, color temperature 2700K, pin spacing 8mm, MOL (length) 1-5/16" (35mm) this is the short length version, replaces both MOLs. [The long version of these, has an MOL (length) of 36-45mm (varies between manufacturers), with only a cosmetic difference.] The only difference between G8 and GY8 is that the pins on GY8 are .5mm longer.